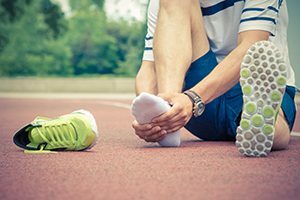 Whether you’re a recreational athlete just looking to stay fit, or a serious competitor looking to push yourself and your performance to the limit, foot and ankle sports injuries are always a concern. They don’t always come as an “ouch!” moment that sends you tumbling to the ground, either. Overuse injuries that grind you down slowly over time are just as much a concern. Either way, an injury to your feet or ankles can be a major obstacle to staying fit, staying healthy, and accomplishing your goals—not only on the field, but in your day-to-day life, too. Worse, if you do nothing about the problem, you drastically increase the risk of re-injury, or developing chronic problems. It’s always best to see us early after your injury to ensure you get a quick, accurate diagnosis and are on the path to recovery as soon as possible! After you’ve taken any appropriate first aid, make an appointment with our team as soon as possible for a full evaluation and treatment. In addition to a thorough physical examination and discussion with you about your symptoms and how the injury occurred, we may have you take an X-ray to help us visualize any potential fractures. Don’t worry, this won’t require an expensive hospital visit—both our offices are already equipped with the necessary technology. Immobilization. Sprains, ruptures, and fractures that remain relatively stable (i.e., the bones are properly aligned and not at significant risk of becoming displaced) can be placed in a cast or walking boot to protect the injury during the natural healing process. Physical therapy. Stretches, exercises, massage, and other forms of physical therapy can be an effective part of the treatment course for certain soft tissue injuries, and a crucial component of the recovery and rehabilitation process for nearly every injury. Custom orthotics. These individually crafted shoe inserts help give your feet the support and cushioning they need to handle the force loads of athletic activity. They can be effective at treating and preventing chronic overuse injuries like heel pain, tendinitis, metatarsalgia, and stress fractures. Extracorporeal pulse activation treatment (EPAT) / shockwave therapy. This exciting, advanced treatment option uses pulses of energy to jumpstart your own natural healing processes and bring rapid healing to many kinds of soft tissue injuries. It is often recommended for those who need recovery as fast as possible, or as an alternative to surgery for those who haven’t found success with other conservative therapies. Surgery. Complex fractures, serious ruptures, or other significant injuries that haven’t responded to conservative treatments may require a surgical repair or reconstruction. If your feet are hurting from an athletic injury, we want to help you get back in the game! You can connect with the Dallas Podiatry Works team and schedule an appointment at either our Dallas or Plano office by calling 972.566.7474. You can also reach out to us by completing a contact form online.